When I was first hired as Trial Happiness Engineer, I was concerned about the flexibility of live chat. I imagined a live chat operator being chained to their desk all day. But since this is Automattic the pioneers of remote working, how was this possible? How was it going to work? Now I work as a Happiness Engineer on a team that has a primary focus on live chat. Part of what attracted me to Automattic was the schedule flexibility. I’m happy to say I have a very flexible schedule and I don’t work the typical 9am – 5pm Monday thru Friday schedule. I’m also anything but tied to my desk. So how does it all work? The following is my own personal schedule, but each Happiness Engineer is different. There is no one-size-fits-all schedule for Happiness Engineers. At Automattic we have a saying that communication is oxygen. Since everyone has a different schedule, part of the oxygen that allows the Happiness team to function is communicating your schedule. Since every Happiness Engineer does this, this allows for us to efficiently schedule coverage for the week. I make my own schedule in that I can pick the days and times that I work, which amount to 40 hrs a week. Out of those 40 hrs, my goal is to spend around 25 hrs live chatting. Currently, we sign up for live chat shifts. So I pick the hours I’d like to live chat. We have a rough estimate about how many Happiness Engineers we need per an hour. Happiness Engineers get to sign up for which hours they’d like to work. Since our main focus is to be readily available whenever our customers need us (24hrs a day/ 7 days a week) I work at least a few weekend days a month. So it’s a balance of working the hours I’d like but also trying to work hours where we need more help. For example, I choose to regularly work my Sunday evenings. I consider my “core work” to be live chatting. So I spend between 4-5 hrs live chatting each day. A few hours of screen share sessions with users that have the Business plan. Then I spend around 30 minutes to an hour catching up on p2 posts & Slack and commenting (p2 posts are our internal blog system). I also try to give myself between 30 minutes -1 hr each day for time to follow up with any live chats, where I need to test something or send them a follow-up email. How flexible is Automattic with scheduling? In my personal opinion, very flexible. 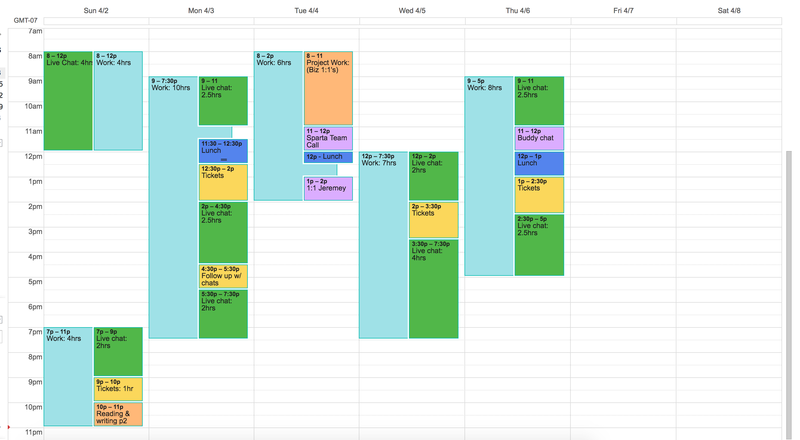 I’ve created a schedule where I work Sunday – Thursday and my “weekend” is Friday & Saturday. I’ve found I need a day during the week to do errands and/or sleep in. This keeps me happiest. So on Tuesdays I work from 8am – 2pm and then on Wednesdays I start work at noon. Yeah, really… 12pm. So I get almost 24hrs off in the middle of my work week. This helps me to disconnect for a bit and come back to work feeling refreshed. I like to get a head start on my week a bit early, so working Sundays is great for me. I work 4hrs in the morning, then I spend the afternoon with my friends and then work 4hrs in the late evening. This works out great because I get to help out with weekend & evening coverage, which is an area that can need a bit more help. I think it also really highlights, how you can work hours that need help coverage-wise but also getting to be super flexible with your schedule. Sometimes, my schedule changes. If I need to take off work a bit early one day, I would log in later in the evening or weekend to help with coverage there. I communicate with my team and my team lead about these kind of changes in my schedule often. For example, if I notice that we’re a bit short-handed during the weekend and I don’t have anything planned, I may switch out work from a weekday and work on Saturday instead. I let my team know, ahead of time. This communication is healthy and let’s them know when I’m around in case they need me. I never felt like I had to jump through hoops to get what I personally feel like is my dream schedule. I feel like Automattic trusts me to work the hours that I need to work, and that I find a schedule that keeps me happy, productive, and contributes to my team’s goals. Having a company that is so flexible with me and my schedule, I tend to be flexible in return. If I notice that we may need an extra hand in the evenings or weekends, if it’s not a huge inconvenience to me or my schedule, I jump in and help out. This doesn’t mean that I work “extra” hours- I switch out those hours for hours that are well covered and either take a longer lunch to run an errand or leave a bit earlier than usual on another day. I still work around 40hrs a week, with those switches. I spent a good 9 months testing out schedules trying to find what worked best for me, before I settled on the schedule I’ve currently working . I’ve personally found that the key to my own efficiency was being consistent. I’ve spent about a year testing different times of the day that I live chat best at. I’m best when I chat roughly around the same time each day. I’ve also found that I don’t like working in live chat for more than 2.5hrs at time. Usually, by then I’m ready for a break and want to step away from the computer for a bit. I’m most productive when I live chat right before lunch or the end of the day, so I get a nice break after my live chat shift. So on most days from 9am – 11:30am and then again from 2:30pm – 5:00pm works best for my schedule. When I do my best to generally do my “core work” during those hours this helps me get more done, since my brain now is hard-wired to know that it is crunch time. For each live chat shift- I stay in one place. I’m either at home at my desk or at my coworking spot. I try to stay in a place where I can be most effective there since I have fast wifi and a large screen for multiple windows. Although somedays… when I need a change of scenery I’ll go to a local coffee shop for my live chat session. Of course, this is what works best for me. Each Happiness Engineer is different and prefers a different schedule. Live Chatting: What’s it like? One of my biggest concerns as Happiness Engineer Trial was Live Chat. I found the idea of it to be very intimidating. What’s live chat actually like though? Well… my first few live chats were a little nerve wrecking. After I got over my own fears, I found live chat to be so much fun. It’s my favorite way to support our users- since I’m able to resolve a users issue in real time. Once you get a good rhythm, I’ve found it to be easier to connect with our users via live chat. I’m able to get to know them… and the sites that they’re building. Our users are awesome. They’re kind and patient. So getting to chat with them all day is fun! What kind of questions are you asked in live chat? There are all different kinds of questions that come in, and you never know what you’re going to get. We get a lot of domain questions. Which is one of my favorite things to troubleshoot now. For example, when it comes to helping a user map a domain they own elsewhere to use with their WordPress.com site by updating name server settings or by helping a user purchase a domain. We also get a lot of questions about getting a theme set up or selecting a theme for their site. Do you have to know the answer to everything? While I’m always striving to learn more, I can say that I certainly don’t know everything. Something that’s helped me be successful is focusing on how to search for the answer. Knowing where to look for the answer is more than half the battle for me rather than having the pressure of knowing every single answer. Also for when I can’t find the answer to a question, we have a Slack channel specifically for those in Live Chat. Since you’re working in live chat with a group of other Happiness Engineers, we’re all in the same Slack channel together and it’s pretty active. It’s one of my favorite channels because the conversation easily shifts between helping each other troubleshoot and small talk. I rely heavily on this channel. So even when I don’t know the answer, someone there usually does. It’s a great resource and helped me feel like I had a safety net for when I first jumped into live chat. So in Summary… I love my schedule, live chatting, and Automattic. It really is a blast and the cool part is you could join us because we’re hiring. How did I get hired? I wrote about that here. If you have any questions about my schedule or how Happiness Engineers schedule themselves, I recommend also reading my Day in the Life of a Happiness Engineer post here, it goes even more in depth into what happens during a typical work day. Thank you! Your article inspired me to go for it and apply at Automattic! Is hiring still going on? I feel encouraged! beautiful story :). Are there still openings for Happy Engineers…can i apply ? I really like your post! Now I feel more compelled to apply to work at Automattic!